2.1 The latest and greatest, or not? Ten eerste gaat dit artikel verder dan het eenvoudig installeren van Apache/MySQL/PHP (en ze configureren). Als dat alles waar u naar zoekt dan kunt u stoppen met lezen na sectie 6. Nu wil ik niet claimen dat ik alle kennis of ervaring bezit om te garderen dat dit de beste of zelfs veilige manier is van het opzetten van uw openSUSE doos als een LAMP (Linux, [Apache], [MySQL], [PHP]) server, het is er echter een die werkt! Ga verder op eigen risico. Italic text is used for additional information about something that will only interest some, it's safe to ignore it. Code blocks are used for commands which you can copy and paste into the console. Below it is often listed what it does if you do not trust the command or are wondering why you should use it. As you may have anticipated you will need to install the following software. The mentioned versions behind the program itself in the table are the ones used while writing this tutorial, it most likely also applies to newer versions. The latest and greatest, or not? Now before we continue, I'll ask you the question do you want the run the very latest versions? No - Make use of this link: Installation or just scroll down to the installation part. Yes - Just continue with "Repositories to select" below. As you have decided to go for the latest and greatest we will need to add some additional software resources to your openSUSE configuration. If you followed the steps above you should be presented with a new window that has a list in which you'll need to select openSUSE BuildService - PHP and openSUSE BuildService - Database by checking the checkboxes next to them. Just hit the ok button afterwards and you're done! If you are asked to "Import a trusted GnuPG Key" click the import button. 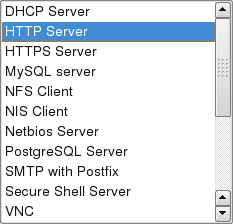 (might pop up more than once, keep hitting the import button) If everything went well you should end up back at the window as in the screenshot below which should now have the PHP and Database repositories added to the list. Congratulations, you have successfully added some new repositories to get the latest version of MySQL and PHP from! Hit the Ok button and proceed with the next step. 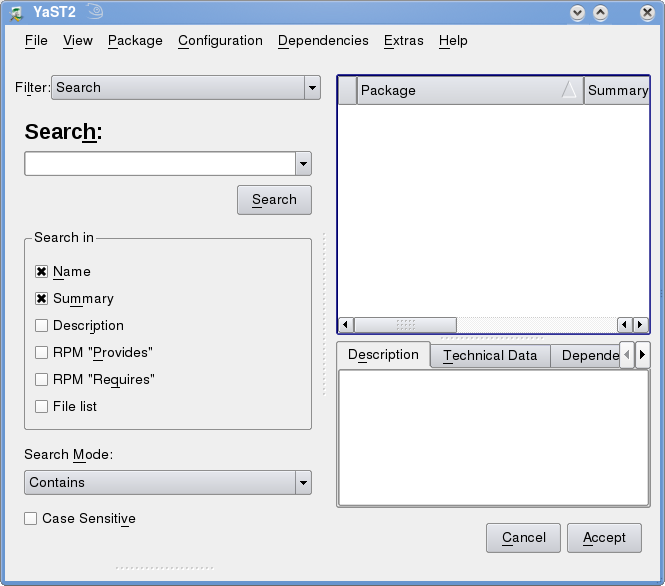 OpenSUSE provides you with an easy way to install all the needed packages. All you need to do is select Patterns instead of Search in the dropdown list behind Filter: this will change the window contents and present you with a long list. 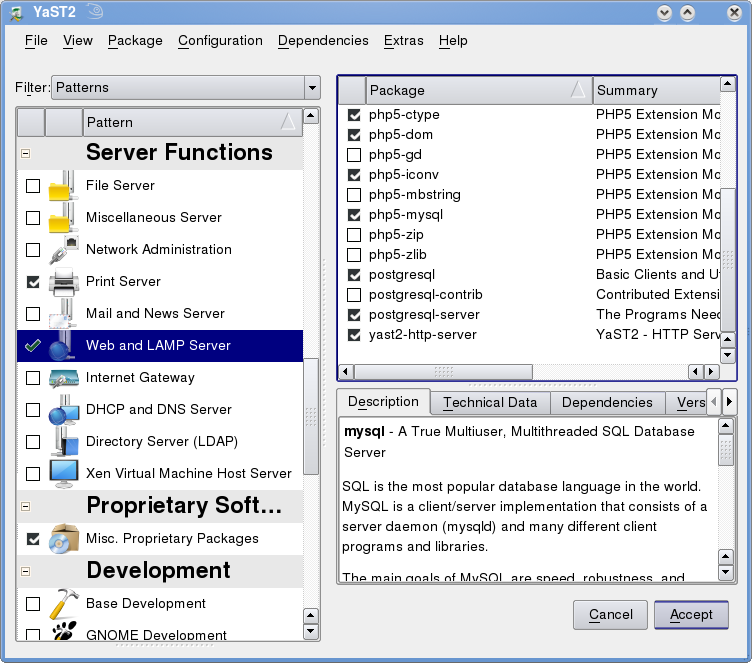 In this list find the option Web and LAMP Server and mark the checkbox before hitting accept. You should still have the YaST Control Center window open. If not, open it up again. 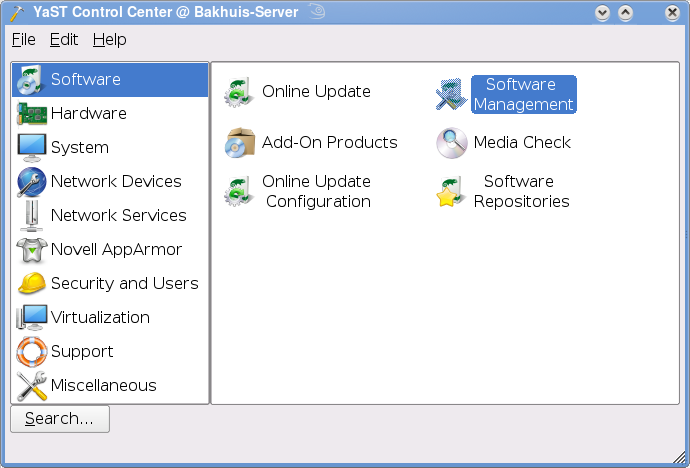 In the YaST Control Center go to System and click the System Services (Runlevel) option. In the new window that should pop up select the Expert Mode radio button and search for the option apache2 in the list. After selecting Apache2 click the Start/Stop/Refresh button (as show in the image to the right) and go for the option Start now which hopefully will give you a popup with the text below. Whether you enabled the service or not, click the Ok button and if prompted to save the changes answer it with yes. If it did not.. it's time to make a post on the openSUSE forums to inquire about help. The easiest way to confirm PHP works is by starting up your favorite text-editor (for example kwrite or gedit) and copy/paste the code below into it. Notice: use <?php only. <? will not work. As you may have noticed from looking at the screenshot, my username is Bakhuis so the path becomes 127.0.0.1/~Bakhuis. If your page doesn't look anything like the screenshot please make sure you wrote the username correctly (including the use of UPPER and lowercase letters) and prefixed it with the '~' character. In case the browser wants to save your php files instead of displaying the content, you should enable php support in the /etc/apache2/mod_userdir.conf file. Add the following line to it, just after the <Directory /home/*/public_html> line and restart the server. First you'll be prompted for a password, leave it blank and hit enter. Now you'll be prompted to enter a password and confirm it, do so. This step is optional and only for those who want to install phpMyAdmin with the use of the repositories instead of doing a more 'manual' install. It's perfectly imaginable you don't want to do this but for example would rather use [phpMiniAdmin], [MySQLQuickAdmin] or one of many others. If that's the case please move onto the firewall configuration part. 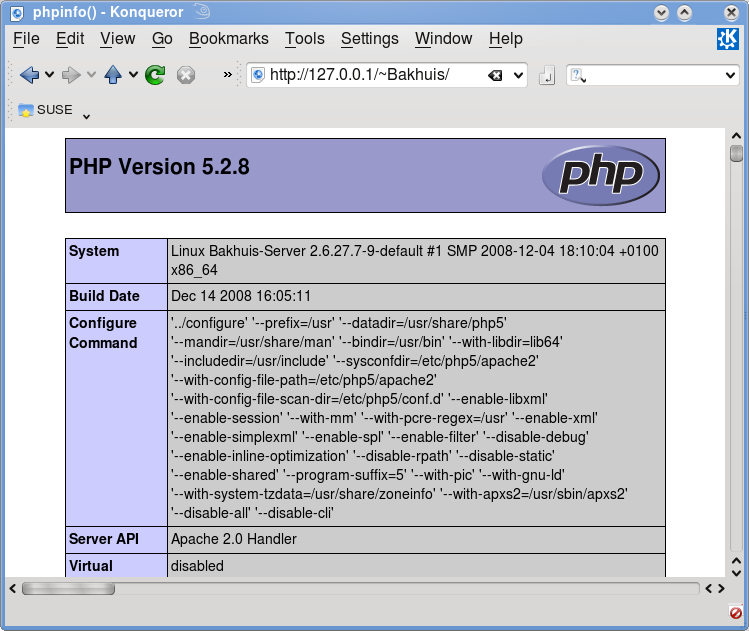 You may install phpMyAdmin manually to the path /srv/www/htdocs. Just download latest version from http://downloads.sourceforge.net/project/phpmyadmin/, extract to /srv/www/htdocs. You'll get a directory with phpMyAdmin looking like /srv/www/htdocs/phpMyAdmin-3.2.1-all-languages. Just rename it to something more conviniet, for example /srv/www/htdocs/phpMyAdmin. Install phpMyAdmin by making use of the one click installer below. The link behind the one click installer is the repository with the phpMyAdmin package in case you're using a different version of openSUSE or prefer not to use one click installers. To check if phpMyAdmin works pay a visit to http://127.0.0.1/phpMyAdmin/ which should come up with a page asking you for a password/username combination. For the username enter 'root' and the password is the one you entered earlier while configuring MySQL. As you arrived here it must mean your phpMyAdmin worked, great! Now let's configure it so we don't see the following message everywhere. Instead of using the "su" command, use the sudo command. This can be achieved by issuing "visudo" as root and adding the user to the wheel group. Enter root password when prompted. Alternatively, use sudo. Open the /srv/www/htdocs/phpMyAdmin/config.inc.php file in the text editor of your choice (Gedit, Kwrite, etc) and change the lines as listed in table below. So two errors left... we'll take care of both of them in one go, just take the following steps. Pay a visit to http://127.0.0.1/phpMyAdmin again and it should be error free. If you want computers other than the one you have installed this on to be able to access your webpages you need to configure the openSUSE firewall to allow traffic over port 80. Now you should be able to visit your site from other computers in the same Local Area Network. If you do not have a second computer you can not test this, so move on the next step. To test this you'll need to know your IP address, follow the steps below to display it if you don't know it. Find the line marked as bold, which is your IP address. From a computer other than the one you've been doing this on but that's in the same LAN, visit the bold number you found in the previous step , for this example that would be http://192.168.1.100. In order to test if your website can be accessed from the outside world you will need to visit http://Your-External-IP. Sites like whatsmyip.org can tell you your external IP. If the "It works!" page isn't coming up you most likely need to configure your router to forward/allow access to port 80 to the IP address of your server. Now if you want more information just search for "http compression" with the web search engine of your choice. The description below might seem a bit long, this is partially because we will create an additional file for the webserver to make use of instead of editting the default files. The reason why we do this is so that you do not have to repeat these steps every time the server software is updated. (these files are overwritten with default files in the update package). Enables the deflate mod, however it's not used until the steps below are followed as well. Now how do you find out if it actually worked? It's actually quite simple, you pay a visit to websiteoptimization.com and use their analyze tool. # Congratulations. This site is using HTTP compression, otherwise called content encoding using gzip. The sizes reported here are for compressed content sent from the server to the client. Installing_and_setting_up_PhpDocumentor_HOWTO Easily and automatically create documentation for your PHP files. I would most likely never figured all of this out without [this] extremely useful page. It's rather dated and was written with openSUSE 9.1 in mind. This article was written by Axeia. Deze pagina is het laatst bewerkt op 10 nov 2010 om 23:28. Deze pagina is 7.436 keer bekeken.